Bear Mattress is engineered to provide optimal cooling and muscle recovery for athletes, and those living an active lifestyle. Each mattress includes a proprietary blend of technologically advanced memory foam and clinically-proven Celliant™ responsive textile technology. The combination of premium materials offers athletes a universally comfortable sleep that is seven times cooler than conventional memory foam, and is designed to reduce muscle recovery time and improve athletic performance. Try it risk-free for 100 nights. 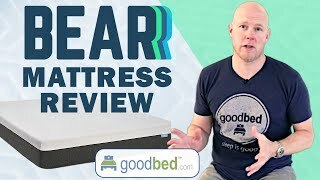 To decide whether Bear is the right choice for you, read GoodBed's expert review of the Bear mattress or watch our in-depth video review of the Bear mattress. Is Bear the right bed for you? Bear mattresses are recommended by 60% of owners on GoodBed (based on 106 ratings + 5 reviews). Do you have something to say about your Bear mattress? Write a Review! Mattress Thickness: 10" to 14.50"
Note: The product line specifications above were derived from the active Bear models listed on GoodBed. As a result, these details may not be comprehensive and may not apply to all Bear models. If you are seeking specifications for a particular Bear mattress, please search for that mattress by name on GoodBed, or check with your local Bear dealer. The Perfect Mattress for Your Active Lifestyle. Bear is a mattress manufacturer founded in 2015 that is based in Hoboken, NJ. Have an update or correction to our information about Bear? If so, please take a moment to suggest an edit. Bear mattresses sold by Bear come with a 100-night in-home trial. Bear mattresses are only available online.